A strong storm system will bring very warm weather Tuesday followed by some strong thunderstorms. Click image to enlarge. An impressive weather scenario is setting up for the Finger Lakes on Tuesday with some late season warmth and thunderstorms. A strong storm system was located over the Midwest on Monday evening. 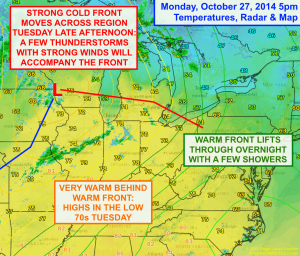 A warm front extends from the low eastward, with temperatures in the 70s and even 80s south of the front. 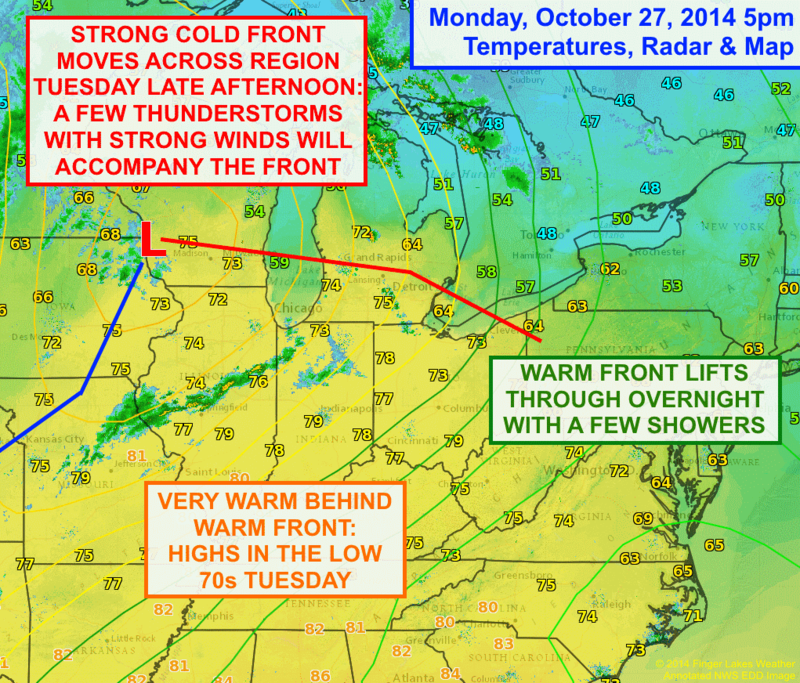 A cold front drags to the south of the front, with temperatures in the 50s and 60s behind the front. 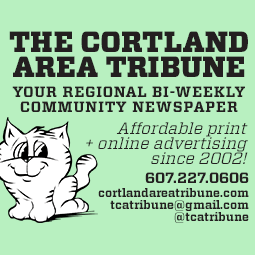 Overnight, the warm front should lift through the Finger Lakes. A few showers will develop along the front, but the majority of the precipitation will fall while it is still dark out. A few showers may linger until 6 or 7am, but the sun should be able to come out by mid or late morning. Temperatures will quickly rise into the 60s and low 70s by the early afternoon hours. 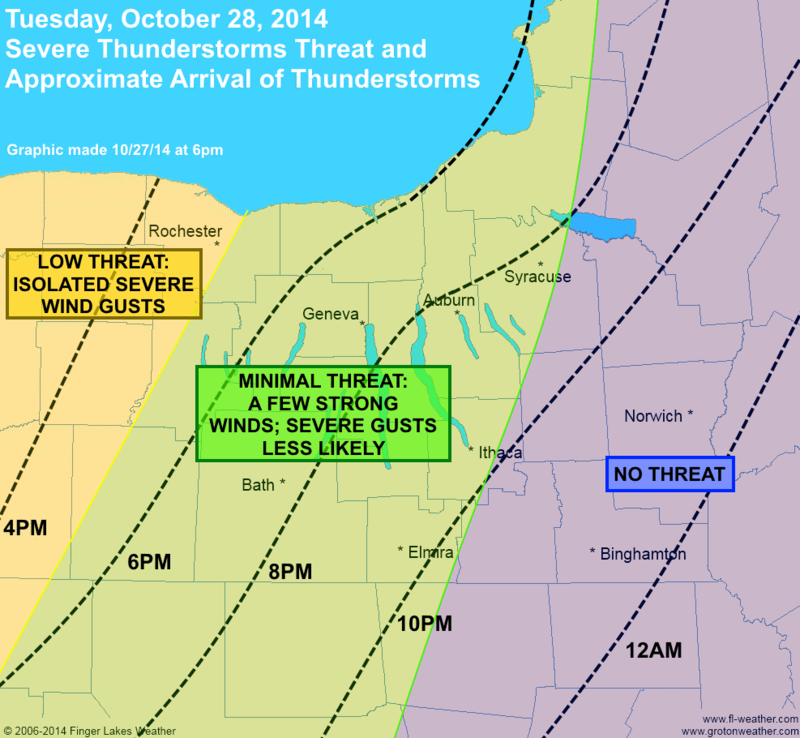 Oct. 28, 2014 approximate arrival times of thunderstorms (dashed lines) and severe threat (shading). Click image to enlarge. By 4pm, a line of showers and thunderstorms should be pushing into western New York. Over the next few hours, this line will march across the Finger Lakes with thunder and some gusty winds. 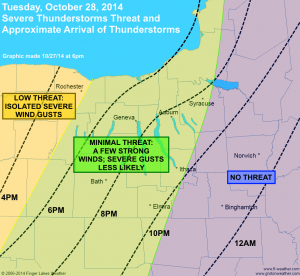 A couple of severe thunderstorm warnings may be prompted, mostly in the western Finger Lakes. By 10 or 11pm, the line should be east of the Finger Lakes and colder air will be working back into the region. High temperatures on Wednesday will be back into the mid 50s. Some buzz is starting to be generated about a storm system this weekend. I will have more details on that in the coming days. 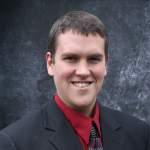 The set up for this system is extremely complex and there are many details that need to be worked out.